Lowdown: Two old people go on a trek befitting much younger, fitter, folk. Bill Bryson's A Walk in the Woods (the book) was published several decades ago. Back then Bryson was a young to middle aged guy taking on the Appalachian Trail. Now that a movie starring Robert Redford has been made of the book, some things were changed while others remained the same. On one hand, the movie takes place today with a much older Bryson as the lead character; on the other, the movie's Bryson, portrayed by Redford, does not enjoy some of today's basic technology. Like smartphones. Which would have really helped through many of the challenges faced by the movie's Bryson as he tackles the woods as well as an old travel colleague. All of which means that, while the adventures befalling Bryson and his old friend (?) Katz (Nick Nolte) are of similar nature to the real life adventures Bryson documented in his book once upon a time, the prevailing themes are different. 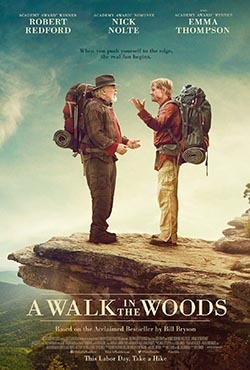 This Walk in the Woods is a story about old people trying to still feel alive, find meaning in life, enjoy it, but also find themselves put in their "rightful" place. The trail is the life, says A Walk in the Woods; it's got a start, an end, you plan for it, your plans fail, you adjust. That is not necessarily worse or better than the book; it's just different. What doesn't go as well is the humour. I love Bryson's humour; that's the main reason I love his books. Alas, what works well on paper feels a tad childish on the screen. And childish doesn't go well with this movie's themes. Overall: To me it felt as if the elaborate message A Walk in the Woods tries to deliver did not make it through that well. We do end up with a nice comedy, and that ain't bad, is it? 3 out of 5 crabs.